Reason # 1: Wicking. Many times, the spot that is being removed has seeped into the backing of the carpet. This is common with pet urine, beverages, and anything that is spilled in “volume”. The material dries in the backing and the cushion (pad) of the carpet. When the spot is cleaned, only the material in the “pile” of the carpet is removed. However, moisture is introduced to into the backing of the carpet. As the spot dries, the material that is in the backing of the carpet “wicks” back into the pile of the carpet much like a candle wick. The good news is that if a spot actually wicks back, it can be removed. When spot cleaning yourself, place a folded white terry cloth towel over the spot just after you clean it while the spot is still moist. Place a heavy object on top of the cloth. Be sure to use something non porous that won’t transfer color onto the carpet (like a paper book cover). Use a brick, a planting pot, or something like that. Reason # 2: Re-soiling. Re-soiling is caused by a sticky residue that has been left behind. The residue may be from the spot itself, the cleaner that was used, or both. Some common residue causes are over-the-counter carpet cleaners purchased at the grocery store. Avoid using these cleaners all together. If you have to use one of these cleaners, or you have to use dish washing detergent, use as little as possible and rinse with water thoroughly. Other residue causes would be oily spots. Duct tape residue, body oils, lotions, etc. 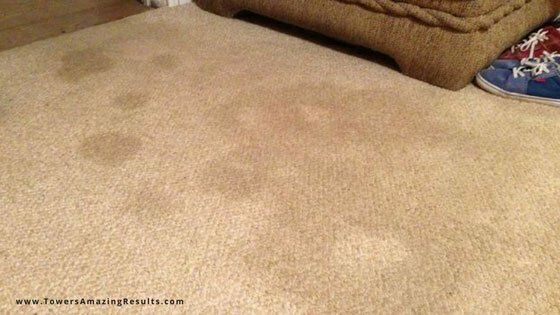 If all of the oily residue is not removed, it will attract soil as the carpet is walked on. Even quality professional cleaning may not remove all oily residue the first time. SPECIAL NOTE: Cheap carpet cleaners use cheap products that are loaded with Optical Brightners. Optical Brightners create an illusion of clean that causes the soil or spot to appear to be removed. The spot is still there. The soil is still there. Optical Brightners create a film that reflects light so that the carpet looks incredibly clean. It’s an optical illusion.